The Town of Stanfield was established upon completion of the railroad line from Raleigh to Charlotte in 1912. Stanfield was named for an engineer who helped complete the rail line through present day Stanfield. 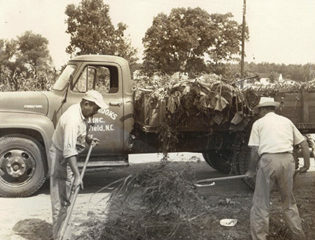 In May 1955 a bill was introduced into the North Carolina Legislature to incorporate and charter the Town of Stanfield. Stanfield’s first Mayor was I.H. Blair and the first Town Commissioners’ were Dowd Greene, Ralph L. Thomas, O.Y. Tucker, Ray L. Little and Zeb Furr. 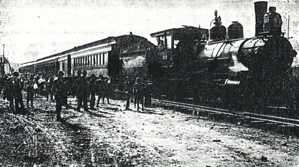 Upon completion of the railroad came the post office. The present Post Office Building has been in use since 1955. Around 1918-1919 three areas schools were combined to create Stanfield School. Those schools were Rocky River, Cedar Hill, and Oak Grove. 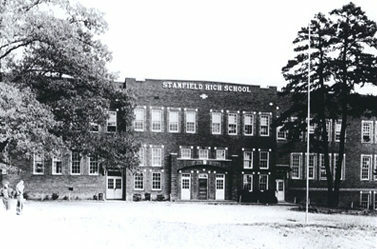 Stanfield High School in 1925, Stanfield High School was built on the present Stanfield School site along Loves Chapel Road. C.F. Henkel (Stanfield Mayor from 1972-1990) began teaching Agriculture at Stanfield High School. He later taught at West Stanly High School when the Stanfield High School was torn down in 1977. The first meal served in the Stanfield School was February 26, 1956. This cafeteria is still used by students at Stanfield Elementary School today. Stanfield High School graduated its last class in 1962. Currently, Stanfield Elementary School houses Pre-kindergarten to Eighth Grade with Ninth to Twelfth Grades attending West Stanly High School. The oldest active church in the Stanfield area is Love’s Chapel Methodist Church. This church was founded in 1857. Pete Henkel Park was built during the 1970’s. Since then several upgrades have been completed. Pete Henkel Park boasts two softball/baseball fields, a tennis court, and playground. Improvements are continuing. Stanfield had a Community Song to the tune of “Carolina In the Morning”. The words to the Stanfield Community song are shown below. Bringing with them ways for folks to travel and to build a new town, Stanfield. Schools and churches, stores and business thrived in those days. People moved to be a part of new ways. Nothing could be finer than to be in Stanfield now when it is growing. A small town deep within the country and a lot of hospitality. Building plans for future growth to make our life all happy, wise, and healthy. So if you’re looking for a place that you can call home. Come on out to Stanfield, you’ll nevermore roam.